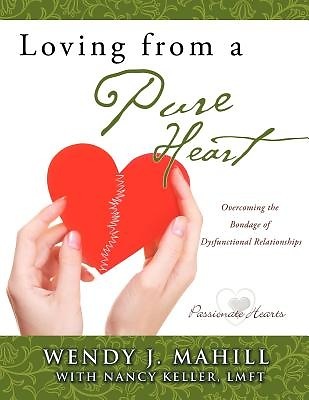 Loving from a Pure Heart is a Christ-centered curriculum for those who struggle with the pain of dysfunctional relationships. It explores the faces of dysfunctional relationships, covering topics like distorted senses of reality, distorted senses of responsibility, control issues, chronic loneliness, and woundedness. It looks at roots of dysfunction, exploring topics like love hunger, addictions, abuse, legalism, and shame bound families. It provides tools for overcoming dysfunction by understanding the call of God to love as He loves and heart issues that hinder that. It talks about the art of building mutual relationships, loving in difficult circumstances, and understanding the love of God and living in light of that love. If you desire healthier, more meaningful relationships this book would be beneficial and can be used in private study, in counseling settings, or support group settings. Wendy J. Mahill is a member of the AACC, a lay counselor at Riverlakes Community Church in Bakersfield, California, and director of Passionate Heart Ministry. She's written three other books: Growing a Passionate Heart designed to help Survivors of childhood sexual abuse, Growing a Courageous Heart designed to help women struggling with eating disorders, and Embracing a Feeling Heart designed to help people understand the role emotions play in their lives. For more information visit: www.passionateheartministry.com. Nancy Keller has been a licensed Marriage and Family Therapist in private practice since 2001. She resides in Bakersfield, California and has a passion to help people become emotionally healthy, She works with people suffering from childhood sexual victimization, depression, anxiety, loss, relationship issues, and those whose spouses struggle with sexual addiction. She leads a L.I.F.E. Group for women whose husbands with sexual addictions and/or infidelity. Nancy trains and equips leaders of Passionate Heart Ministry and enjoys sharing her own personal journey overcoming the effects of sexual abuse.